WONDERFUL READ!!! This book is amazing. It is common sense pure and simple. Bethany explains food and exercise in a way that is understandable and she helps you realize how stupid the American way of eating, dieting, bingeing, and living is. It is such a breath of fresh air to read something like this, compared to all the diet books that say "this is not a diet". Bethany says this also but really means it. You really can eat anything, you do not have to portion or measure food, and you can live a normal life. By talking about her past experiences with food, Bethany is relatable and real, and she does not hold herself higher than the average person. She goes over so many important issues in this book. I will probably re-listen to it in a few months so that it stays fresh in my mind. The one thing I felt she could have done better is the reading. At times her voice is a little monotonous and sometimes it feels like lecturing but it is all things you need to hear. I highly recommend to anyone who has any food or exercise issues!! I love this book! It is not a diet! Bethenny Frankel gets you to refocus your thoughts and attitude on how you think and feel about food and how you eat. She walks you through the vicious cycle one can go through, specifically women, when you diet, binge, then feel extreme guilt. 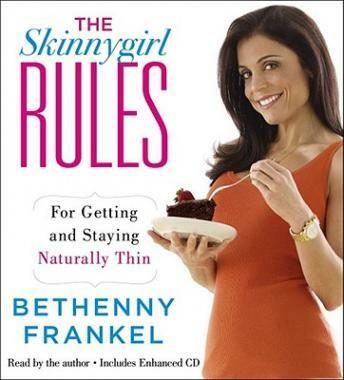 I also enjoy how Bethenny Frankel herself reads the book to you. 3 cds, and should have been less than 1. Her writing style "Im going to tell you what Im going to tell you. Then Im going to tell you. Then Im going to tell you what I told you." I listen, not for eating advice, but interesting tips, and to see what fame does to a person. Her volume and intensity, while narrating, is constant. To say "monotone" would be incorrect, but equally pleasant. Reminiscent of how hard Susanne Sommers is to listen to, irronically, also about eating styles. And the content... She opens a chapter with "you can eat it all, but not all right now". She adds nothing more, but continues to talk for a chapter. She gives a zillion ways to not eat everything that is served. Then she says "so in summary, you can eat it all but not now, remember that you can eat part now, or box some, or..." you get the picture... If she gave her 10 rules up front (vice starting each chapter with one), you wouldnt have to listen to the rest of the book.